" A thing is right when it tends to preserve the integrity, stability, and beauty of the biotic community. It is wrong when it tends otherwise." Hale Ridge Road Farm is located in west-central Illinois near the small village of Camden, Illinois (population 97) in Schuyler County. Consisting of 74.61 acres set in the beautiful La Moine River Valley, it is an incredible property with many unique characteristics and is an excellent place for hunting whitetail deer, wild turkey and small game and birds. In addition, there are numerous potential home or cabin site locations. Its water features support an incredibly diverse array of wildlife, which are abundant year-round. Click here to see high resolution photos of Hale Ridge Road Farm! 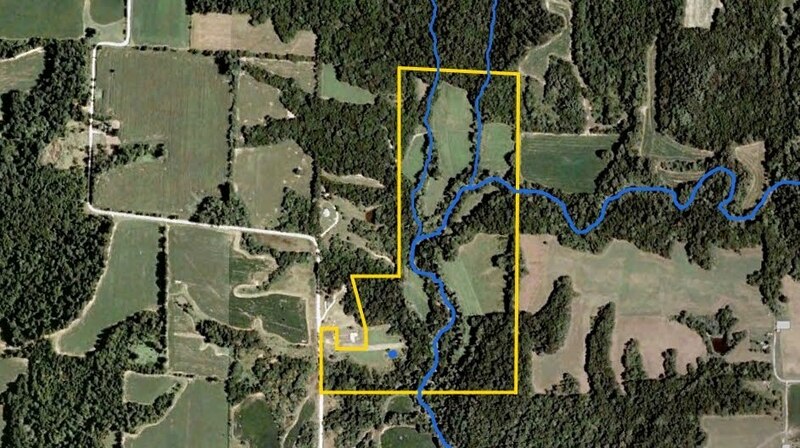 Below is an aerial photo of the property with the boundary lines outlined in yellow. This property is well connected with surrounding timber so there are excellent wildlife travel corridors. 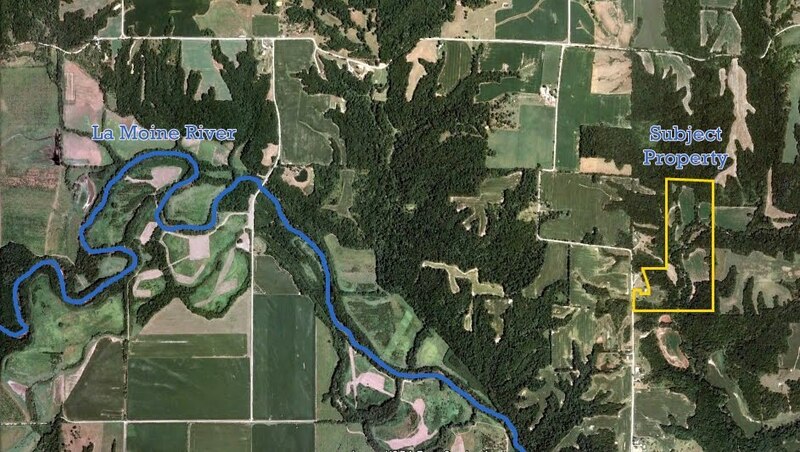 The thick blue line represents Brushy Creek while the two thinner blue lines represent smaller streams. The blue dot shows where the small pond is located. The property is less than a mile from the La Moine River. The entire La Moine River Valley boast beautiful scenery, rolling hills and bountiful wildlife with a much of the surrounding land enrolled in the Conservation Reserve Program (CRP) and Conservation Reserve Enhancement Program (CREP). Located within a short drive of many major cities, Hale Ridge Road Farm is a perfect weekend retreat or home site. 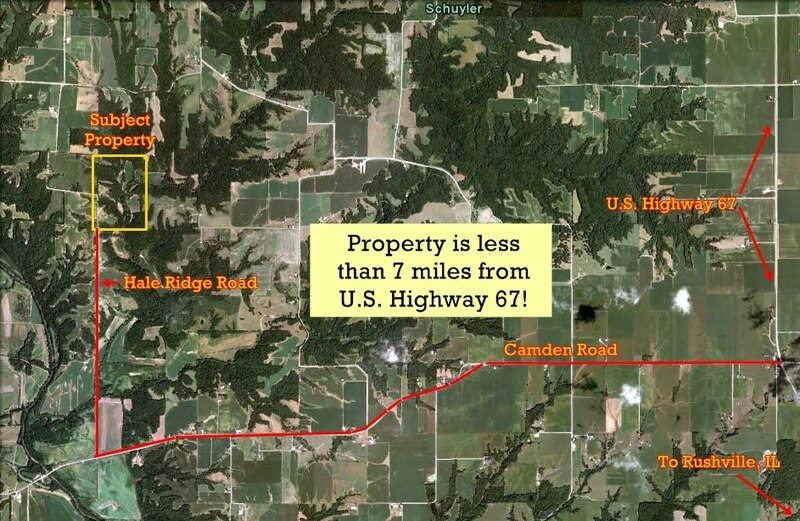 As the map below shows, it is less than 7 miles from U.S. Highway 67, but the property feels extremely secluded in a low population area offering the best of both worlds: convenience and privacy. This property boasts some of the best deer hunting in the country! This part of Schuyler County is highly-regarded by local residents and savvy hunters alike. Schuyler County, part of the famed "Golden Triangle" of Illinois located in the rich fertile lands between the Illinois and Mississippi Rivers, is full of opportunity. The deer hunting on this property has been proven over a long period of time and is second to none. It is such a great location that a local outfitter has consistently secured the property for its clients who come to hunt from all over the county. 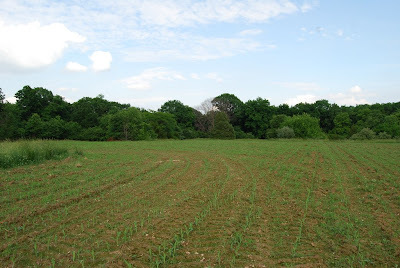 Developing the bottom fields of this property, which total more than 20 acres in size, into high quality food plots would make the property even more attractive to mature bucks in the area and increase the holding power of the property. A population of quail are also present on the property and we have actively developed the quail habitat on the property through planting two acres of native grasses and forbs in 2010 and by thinning and felling trees in a native prairie remnant on the property. Though much attention is rightfully placed on the outstanding whitetail deer hunting available in west-central Illinois, you should not overlook the awesome predator, furbearer and small game hunting opportunities that would be available to you through owning this property. Some of the best experiences with children and family members can be had afield in the beauty and serenity of nature hunting the smallest of game (squirrels, rabbits, quail, etc.). If you are a trapper, you will find plenty of game in the mink, beaver, raccoon, badger, fox, coyote and other animals that are present on the property. Being part of the La Moine River Valley, wildlife is plentiful and the sporting opportunites are very rich. Over time, land has proven its ability to be a strong hedge against inflation generating superior investment returns with attractive tax characteristics. Many, including us, believe that timber and agricultural land currently represents one of the most compelling investment vehicles available with less risk than most traditional investments. After all, land is always going to be there. It can't go bankrupt and disappear like stock investments can. Combined with the aesthetic and recreational value it offers to its owners, the added financial benefits make investing in land an easy decision. 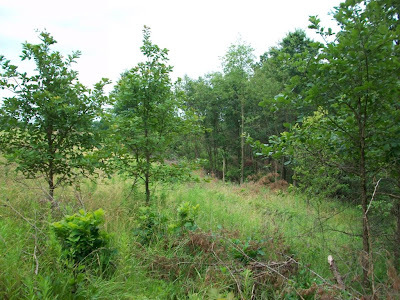 This property has excellent timber potential with numerous high quality hardwood species on the property including White Oak, Black Walnut, Cherry, Hard Maple, Red Oak and others. Black Walnut is the most highly valued tree species in North America and countless numbers of these grow along the creekbanks and bottoms of Hale Ridge Road Farm. In addition, other high quality trees like Ash, Hickory, Osage Orange and Red Elm are also plentiful. The property is being offered for sale at $269,342, which equates to $3,610 per acre. Seller financing is available with a 10% to 15% down payment and 8% annual interest on the remaining balance and no prepayment penalties. This purchase conveys full property rights to the purchaser, including both surface and mineral rights. Through a purchase, you will acquire the entire property, all 74.61 acres (i.e., 100% of the property). The property will be conveyed by a general warranty deed and customary title insurance will be provided to the purchaser. In 2010, property taxes were less than $300 per year. There are 26.4 acres of tillable ground which are either currently in agriculture or could be used for this purpose. The west-central Illinois region is widely know for producing bountiful crops of corn and soybeans, which rotate annually for nutrient cycling purposes. For the hunters out there, converting some of these fields into food plots would be an amazing draw to the property for all big bucks in the area. Hale Ridge Road Farm is an exceptional property for wildlife regardless whether your interests are in hunting, nature-watching and preservation. Wildlife is abundant on the property and includes species such as Whitetail Deer, Wild Turkey, Badger, Mink, Beaver, Coyote, Fox, Barred Owl, Bald Eagle, multiple types of hawks, Raccoon, Opossum, Rabbit, Quail and many others. The elusive bobcat has been making a comeback recently and has been spotted in the Camden area and throughout the La Moine River Valley and may count Hale Ridge Road Farm in its territory. This is a very unique property and has amazing conservation and wildlife potential. The reasons for this are manifold including its proximity to the La Moine River (see photos). There is a small native prairie remnant which has been visited by the Illinois Department of Natural Resources. It is a relic from the past, which should be treasured and cared for. Over the past two years, we have cleared out woody bushes and trees which were invading the prairie. It could benefit from a controlled burn in near future. Many of the fields that are near the creek could easily be converted to small wetlands which would make this property a spectacular waterfowl paradise! Finally, the fields in the creek bottom (totalling approximately 24 acres) would be excellent candidates for CRP and CREP in the future, subject to cropping history requirements (i.e., the length of time they have been used in agriulture). Hotel accomodations as well as multiple restaurants and bars can be found in the small, friendly and clean town of Rushville, Illinois, which is a quick fifteen minute drive from Hale Ridge Road Farm. This property has frontage along Hale Ridge Road. Electrical power lines run along Hale Ridge Road and could be connected to the property very easily. 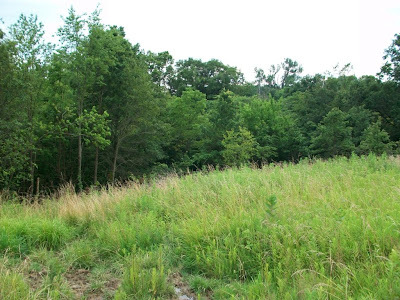 There is an excellent homesite near the entrance to the property. This property is loaded with water features including beautiful Brushy Creek, a small pond, an old well (would be great for watering plants or washing equipment), and numerous streams and rivulets that flow into Brushy Creek. Brushy Creek is a large fast-running creek offering great recreation such as wading, kayaking and canoeing. What can be a deep rushing torrent during the Spring rains calms to an idyllic crystal clear stream during calmer weather. During most periods, it can be crossed by foot or on an ATV. Not seeing what you're looking for? Please take less than 1 minute to fill out this brief questionnaire so that we can better serve your needs. If you have any questions at all, do not hesitate to send us an email. Click here to see high resolution photos!